Versata Software Inc. et al v. SAP America Inc et al. — Mr. Alavi was a member of the AZA legal team that Versata/Trilogy hired a few months before the retrial of a significant patent case. AZA was tasked with developing the lost profits claim for Versata/Trilogy. 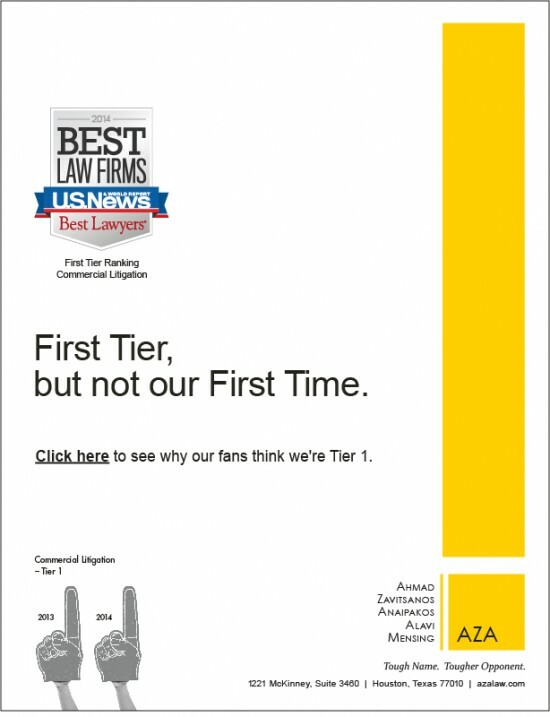 With AZA’s help, Versata/Trilogy secured the eventual $391 million patent infringement verdict, the second largest patent verdict reported to Verdict Search nationwide in 2011 as of May 31. 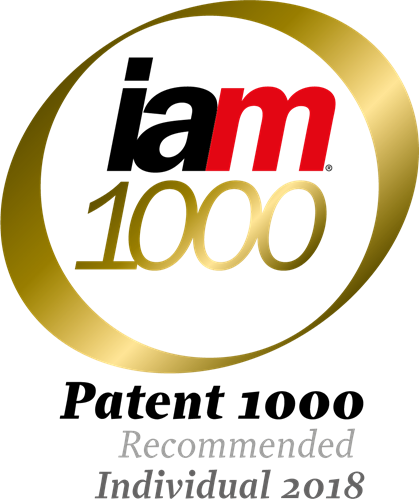 Read about the patent verdict here. Mr. Alavi and the AZA team beat the odds when they obtained a $15.7 million federal jury verdict in Texas in this patent infringement case. Jurors deliberated only one hour to find that Samsung Electronics infringed on two Rembrandt Bluetooth patents. See a news story on the case here. Saint Lawrence Communications v. Motorola. 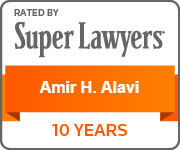 — Mr. Alavi won a $9 million federal jury verdict for Texas-based patent licensing company Saint Lawrence Communications LLC against technology heavyweight Motorola Mobility LLC for patent infringement. The case was tried in the U.S. Eastern District. Media coverage of the case includes Law360 in the story here. XimpleWare, Inc. v. Versata Software Inc., et al. 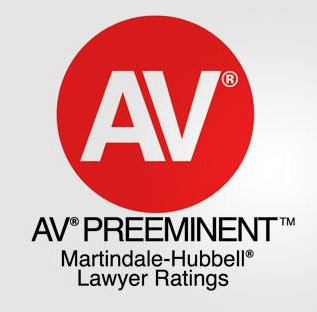 – Represented Versata and its clients in a patent infringement lawsuit, and companion copyright lawsuit, brought by an open source software provider. Secured dismissal of claims against Versata’s clients and the case was settled on a confidential basis on the eve of a ruling by the Court on a sanctions motion filed by Versata and its clients. Besides the intellectual property cases, Mr. Alavi has litigated cases involving hedge funds and investment partnerships, securities fraud, mergers, energy trading, software development, natural gas pipelines, oil & gas mineral interests, construction defects, and the automotive industry. Since 2006, he has recovered more than half-a-billion dollars in settlements and verdicts for his clients. 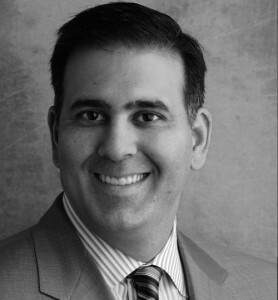 Prior to joining the Firm, Mr. Alavi was the general counsel of a privately-held company with over 5,000 employees. While there, he managed the mergers and acquisition department and handled several acquisitions of public and private companies. Houston v. Saracen Energy Advisors, L.P., et al. – Represented a natural gas energy trader in claims for $30 million in bonus and deferred compensation. The case settled on a confidential basis. Culliver v. George Bishop, et al. – Represented the plaintiff, a shareholder of an independent oil and gas company, in a shareholder oppression case seeking over $150 million. The case settled on a confidential basis prior to trial. Brown Investment Management, L.P. v. Parkcentral Global, L.P. – Represented an investor in the Parkcentral hedge fund which, with a related hedge fund, lost over $2.5 billion. In an important case involving hedge funds, Mr. Alavi secured a verdict granting his client access to the fund’s investor list. The case was appealed to the Delaware Supreme Court and affirmed. Mr. Alavi represented the former employee of an independent oil and gas exploration company in an arbitration seeking to recover plaintiff’s $60 million ownership interest in various oil and gas properties. The case was resolved on a confidential basis. Tennessee Gas Pipeline Co. v. Columbia Gulf Transmission Co. – Represented Columbia Gulf Transmission Co. in a breach of contract lawsuit involving control (and the original construction) of the Blue Water offshore natural gas pipeline system. Following a bench trial, the case was resolved on a confidential basis. Marc Werner, et al v. KPMG, LLP – Represented limited partners of an investment partnership in a securities fraud case against KPMG. The case was resolved on a confidential basis. WesternGeco, LLC v. GX Technology Corporation, et al. – Represented six employees of GX Technology in a multi-million dollar theft of trade secrets lawsuit by WesternGeco. Secured a voluntary dismissal of all six defendants on the eve of trial. Lenore Schmick Trust, et al v. KPMG, LLP – Represented limited partners of an investment partnership in securities fraud case against KPMG. During trial, the case was resolved on a confidential basis. Collins v. Beazer Homes USA, Inc. et al. – Represented Judy Collins in one of the first Sarbanes-Oxley cases to be filed in federal court. (see Business Week article). Rowe v. Baker Hughes, Inc. – Represented Paula Rowe in ERISA whistleblower and age discrimination case against Baker Hughes. Alan Ferguson v. Baker Hughes, Inc. et al. – Represented Alan Ferguson in a whistleblower lawsuit against Baker Hughes (see New York Times article). As a result of Mr. Ferguson’s allegations, the Department of Justice and the Securities and Exchange Commission began an investigation into Baker Hughes’ business practices (see news article). As a result of that investigation, which expanded to include conduct in other countries, Baker Hughes reached a record $44.1 million settlement with the SEC and Department of Justice which included one of its subsidiaries pleading guilty to violations of the Foreign Corrupt Practices Act (see Reuters Article). Mr. Ferguson’s case was resolved on a confidential basis. Chung’s Gourmet Foods v. Delta DailyFoods Texas – Represented Chung’s Gourmet Foods, one of the world’s largest manufacturers of egg rolls in a tortuous interference case against Delta DailyFoods. After nearly two weeks of trial, Mr. Alavi and the trial team obtained a verdict and judgment in the amount of nearly $18 million. Reducing Litigation Costs in a Down Economy, Donavan Watkins Continuing Legal Education Program, June 2009. Requests for Production of Documents and Requests for Disclosure, University of Houston Law Foundation, Advanced Evidence and Discovery Course, November 2008. Practical Considerations in Dealing with Intellectual Capital, Lorman Education Services, Documents Employers Can’t Live Without, June 2006. Retaliation Claims: Including Sarbanes-Oxley, University of Houston Law Foundation, Employer-Side Employment Law, December 2005. Preparing your Witness for Deposition and Trial, University of Houston Law Foundation, Litigation and Trial Tactics, October 2005. Theft of Trade Secrets, Employee Raiding and Unfair Competition, University of Houston Law Foundation, Corporate Partnership and Business Law, June 2004. Retaliation Claims in Federal and State Court: Including Sarbanes-Oxley Whistleblower Claims, University of Houston Law Foundation, Employment Law Seminar, April 2004. Preparing your Witness for Deposition and Trial, University of Houston Law Foundation, Litigation and Trial Tactics, March 2004. Unfair Competition, Theft of Trade Secrets, and Employee Raiding, University of Houston Law Foundation, Corporate Partnership and Business Law, June 2003. Employment Law Aspects of the Sarbanes-Oxley Corporate Responsibility Statute (co-author), University of Houston Law Foundation, Employment Law Seminar, March 2003. Point/Counterpoint of the Sarbanes-Oxley Act of 2002: a View from the Employer’s and Employee’s Perspectives (co-author), State Bar of Texas, Advanced Employment Law Course 2003, February 2003. Employment Contracts: What to include, What to Avoid, South Texas College of Law, Business Organization Course, October 2002. Credibility and Impeachment: Fundamentals of Direct and Cross-Examination, University of Houston Law Foundation, How to Offer and Exclude Evidence, September 2002. Trade Secrets and Covenants Not to Compete, University of Houston Law Foundation, Employment and Labor Law, September 2002. Evidence Without Witnesses: Stipulations, Discovery Products, Judicial Notice, Summons, Etc., University of Houston Law Foundation, Trial Tactics, September 2002. Protecting or Raiding Intellectual Capital, South Texas College of Law’s Labor and Employment Law Conference, July 2002. Preparing your Witness for Deposition or Trial, University of Houston Law Foundation, May 2002. Featured Speaker, IT Service Summit, San Francisco, California, March 2000. Contributing author, Survey of State Class Action Law, A Report of the State Laws Subcommittee of the Class Actions and Derivative Suits Committee, Section of Litigation, American Bar Association, 1999.